Is the system right for me? Our commitment to customer satisfaction is unrivaled and our service is second to none. We work tirelessly to get you back up and running so you have less downtime. When I call in with repair questions about my Fastrak, what should I have ready? When calling in have your Fastrak number ready to give to the sales associate so he can identify your specific system. It can be found in the lower right hand corner of the bulkhead. Should I lube or remove the wheels or bearings to keep clean? Never lubricate the wheels or bearings. They are sealed and the lube will attract dust and dirt causing the bearings to fail prematurely. Can I use any cleaning agent to keep my tarp clean? Never acid wash the tarp. Wipe the tarp or graphics with soap and water. What is the correct way to tighten my A-frame? Tension one side no more than 1/2 way before you latch and tighten the other side. Once 2nd side is tensioned, return to side you started with and tension the rest of the way. What should I do if my A-frames bind or catch? Try greasing your front slide plate, channel, and large flat washer behind the crank receiver. What are the most common causes of bulkhead leaks? First remember that temperature changes cause condensation on the inside of the system. Always inspect the rubber seal on the front of the front bow. Try adjusting the set nuts on the front over center latches if so equipped. Manufactured, Installed, and Serviced by Tarpstop. With a standard 7'-3" inside height it comes available up to 98.5" on our kits. The Fastrak II comes installed with 6061-T6 aluminum bows for superior strength and light weight reinforced zero radius corner connectors for exceptional clearance. With an e-coated and powder coated alloy steel carriage it will outlast all the competition. Equipped with oversized wheel bearings, offering outstanding durability. With a heavy-Duty 20oz Vinyl fabric with full length skylight high-gloss acrylic coating, the Fastrak repels road grime without a hitch. Along with a roll-Up rear door for full access, custom graphics are available to brand your Fastrak II making it a moving billboard! With an integrated man door with locking T-Handle latch and modular aerodynamic bulkhead design, the Fastrak II is the most thoroughly engineered Rolling Tarp System on the market today. Options for this system include a nose cone, work lights, bulkhead vents, full size man door, clearance lights, polished stainless, integrated storage and more. Our 2 Year Comprehensive Tip to Tail Coverage on all hardware with labor included offers 2 year coverage on wheels and bearings and 5 year coverage on bow corners. It is this type of coverage that others have tried to copy, but failed to deliver when standing behind their product. The Fastrak is engineered for years of trouble-free use and supported by Tarpstop's legendary service. Limitations Apply, WE SERVICE ALL BRANDS! No ratchets! You’ll save time with the SIDE-LOK tarp systems for Grain Trucks and Dump Trailers from Tarpstop. Our aluminum latch plate and adjustable crank arm eliminate the need for ratchets or ropes to fasten the tarp. Just roll the tarp under the latch plate, lock the crank and go! DUE TO THE NUMEROUS SIZES, PLEASE CALL FOR YOUR QUOTE TODAY! Every part that you may need is listed below. Just click and order!!! EZ-OVER FLIP TARP SYSTEMS by TARPSTOP®. Premium quality Flip Arm Tarp Systems at great prices. Save an amazing amount by buying from the manufacturer. Made with 6061 Aluminum Alloy for superior strength and corrosion resistence, it comes with a choice of electric or manual ground crank. Electric systems include the switch, breaker, wire and motor. Made with a modular design which adapts to varying widths and lengths with a choice of mesh or vinyl tarp. Included with your system is an extruded aluminum wind deflector. The trailer systems include underbody springs and an electric disconnect. 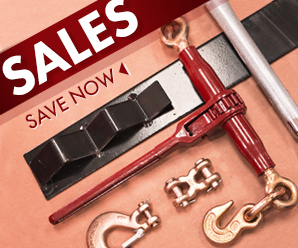 With a 2 year warranty on the electric motor, hurry and place your order TODAY! Covering your load is quick and easy with the EZ-SLIDE Cable Tarp System from Tarpstop! The system is designed to operate completely from the ground, so there's no tarp straps and no need for climbing on the load. Just crank your tarp shut and you're back on the road. Or with our electric drive option, just flip a switch in the cab to cover and uncover the load without leaving your seat! Our system uses extra-strong steel bows that glide on cables with plastic glides to allow smooth and easy operation. Special brackets engage the tarp to prevent wind from lifting the tarp while in use, and cable tension is easily adjusted using our adjustable rear idler pullies. We manufacture our tarps from heavy-duty fabrics. Just choose a mesh or vinyl tarp depending on your application. A polished aluminum wind deflector is included for protection of the tarp and an attractive installation. Also called Rack Tarps, or Top Tarps, they are designed to be installed over a system of stakes, panels, and bows (A Sidekit) on a flatbed trailer where the front of the tarp is fitted to the trailer bulkhead. With premium quality at a great price, the Dynalite Side Kit System is a tough, high quality tarping system that makes ample use of 6061-T6 aluminum. This makes for a light weight and long lasting durability. With side stakes, bows, panels, and an amazing 18 oz. Vinyl shelter-rite fabric by Seaman Corporation. You have a choice of polyester or Nylon for ultimate durability. A typical SIDE-KIT TARP is 48' Long and is Wide enough to overhang the side panels by about 18 inches when installed over 30" rise tarp bows. The front of the tarp is fitted to a 102" wide bulkhead. Other sizes and dimensions are common too, so give us a call with your specifics and we'll make it happen! We call them "Steel Tarps" because they are sized for covering loads of flat steel or metal coils. Steel tarps are usually 16' wide, so they will have a 4' side drop when used on an 8' wide load. A typical Steel tarp is 16' wide and 20-27' long. 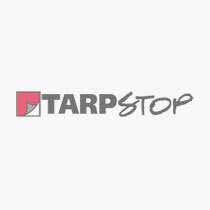 TARPSTOP® Brand tarps are Made in the USA. Made with 18oz vinyl coated fabric, we manufacture tarps in our own Ohio and Indiana factories for the best quality possible. We weld our seams, and our hems are double lock-stitched with #207 bonded thread. We install brass grommets all around the hem plus 2 additional rows of dee rings every 24" on each long side. The dee rings are sewn under continuous rows of seatbelt webbing and the rows are placed 2' and 4' up from the bottom edges, so that the opposing top rows on each side are 8' apart. An end flap is also available. Our import tarps are similar to those sold at online retailers. Some customers have requested these tarps, and if you have a fleet that you need to outfit with some inexpensive gear these could be a good option. We bring in several sizes of import tarps, but large quantities and long lead times are required, so custom colors and options are not typically available with this product line. Lumber Tarps are sized for covering 8' tall loads of lumber or similar. Lumber tarps are usually 24' wide, so they will have an 8' side drop when used on an 8' wide load. A typical Lumber tarp is 24' wide and 27' long. TARPSTOP® Brand tarps are Made in the USA in our own Ohio and Indiana factories for the best quality possible. Made with 18oz vinyl coated fabric, we weld our seams, and our hems are double lock-stitched with #207 bonded thread. We install brass grommets every 24" around the bottom edge plus 2 additional rows of dee rings above the hem on each long side for a total of 3 tiedown rows. The dee rings are sewn under continuous rows of 2" wide seatbelt webbing and the rows are placed 30" and 60" up from the bottom edges. Additional rows can be added to allow the tarp to be pulled down to cover shorter loads, but many folks will grab a smaller and lighter tarp for those loads. An end flap is standard on lumber tarps. Machinery Tarps are best for covering large irregular sized loads such as manufacturing equipment. Machine tarps are usually at least 24' wide and 30' Long so they will either cover a large machine or simply a load with one tarp. End flaps are optional depending on user preference and size of the loads being hauled. Since it's usually impossible to determine in advance what size is needed, it's best to get a large rectangular tarp that can be turned sideways for different configurations. Dee Ring Tiedowns are recommended for general use. We put #4 brass grommets all around the hem plus several rows of dee rings sewn every 24" under continuous rows of 2" seatbelt webbing and spaced 30 inches apart above the edge (hem) on all 4 sides of the tarp. If in doubt order an extra set of dee rings on your tarp and carry plenty of padding material to help with tarp tie-down on odd sized-loads. Lightweight fabric is available for the side drops on machine tarps, but is not recommended due to the nature of the product being transported. Smoke tarps are designed to secure the front of your flatbed load and keep it free from dust, smoke or soot. A smoke tarp (also sometimes called a nose tarp) is smaller and more square than a regular steel or lumber flatbed truck tarp, as it's designed to cover the top front of a load. Made out of 18 ounce heavy duty vinyl, smoke tarps can be flat or fitted; fitted options generally have a boxed in top to help secure the tarp around the edges of the load, while flat ones are a simple rectangle that can be folded over the edges of the cargo. Coil Tarp are designed for Coils on your flatbed. Coil Tarps help keep steel coils securely mounted with flatbed coil bags. The Coil Tarps are made of heavy-duty 18 ounce vinyl coated tarps to secure any size load you might be carrying. Coil Tarps includes triple roll hems before double stitching them and reinforcing them with two inches of webbing. The resulting hems are sturdy enough to give you the strength you need to secure your load without fear of tears in the fabric. Coil Tarps are made to withstand the stress of tightening your chain and they hold up to the inevitable rubbing and chaffing that occur when securing your load.